The DJI Mavic 2 Enterprise Dual is an oddball in DJI’s line-up. The title itself is a mouthful, and despite the Mavic 2 part of the name it’s not designed for your typical hobbyist. As far as I’ve seen this drone has gone a little under the radar regarding news, but it actually represents a solid investment for a powerful drone with professional thermal imaging capabilities. 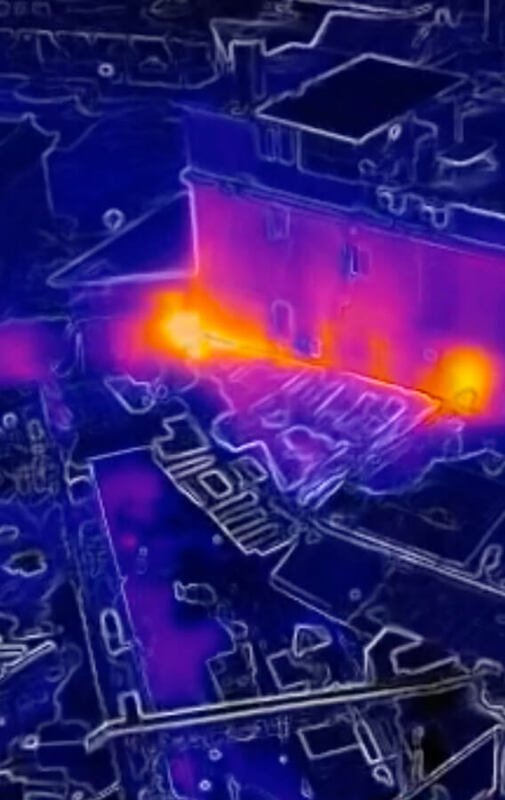 Just in case you’re not versed in typical thermal imaging camera costs (like me) the enterprise thermal camera would not be considered a premium tier like the Zenmuse XT2 for example, but it’s capabilities, and overall hardware design makes it something to be considered in the same breath. Gimmick or a professional thermal solution? This is unquestionably a professional solution. Yes, there are thermal cameras that can outperform M210 with an XT2 camera for example, but this particular equipment comes at the cost of deployment speed, manoeuvrability and cost. The Mavic 2 Enterprise Dual (M2ED) is equipped with one of FLIR’s smallest thermal cameras and in the shell of a Mavic 2 helps to make sure that it can be transported easily and deployed exceptionally quickly. When considering the scenarios in which drone thermal cameras are used like firefighting and Search and Rescue time is of the essence and while higher-end machines might take time to prepare the Mavic 2 Dual can already be in the air scanning for people to rescue. The M2ED comes with a huge range of uses and features to customise your thermal camera. In the standard view, you have the option for only InfraRed, MSX or Visible. MSX is an overlay for outlines (this can be adjusted). The picture above is a perfect example of how MSX combines both Visible and Thermal to help improve visual accuracy. 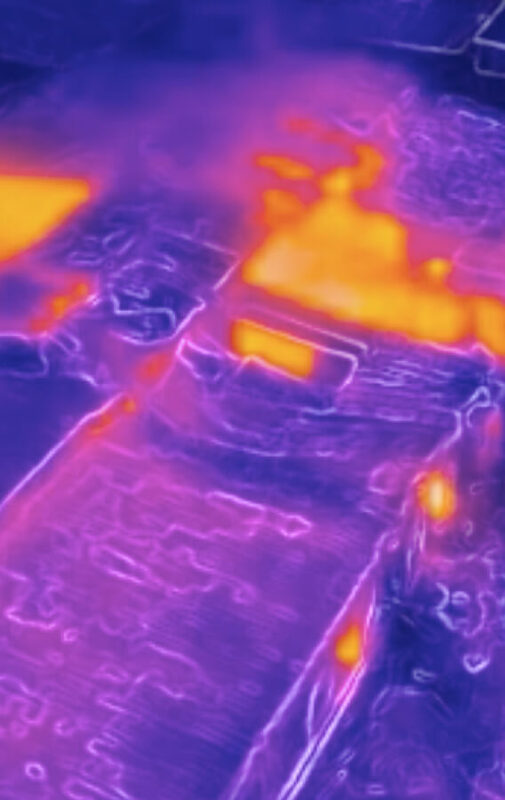 Typically, thermal images just look like blurry hot to cold blobs, but the MSX shows how MSX can help provide more information about the picture like doors windows and other structural features. The M2ED main thermal screen also allows you to use the spot meter function that shows any the temperature of any point on the screen. The ‘spot’ is 5x5 pixels which means the further zoomed out you are on a situation the less accurate this measure is as it takes in too much data from the surrounding area. Another useful feature you can use in conjunction with Spot sensor or Zone sensor is the Temp Alert, this triggers if a particular area is over a certain temperature threshold. When triggered the device will make an audible alert for you. Each palette is good for a different scenario. 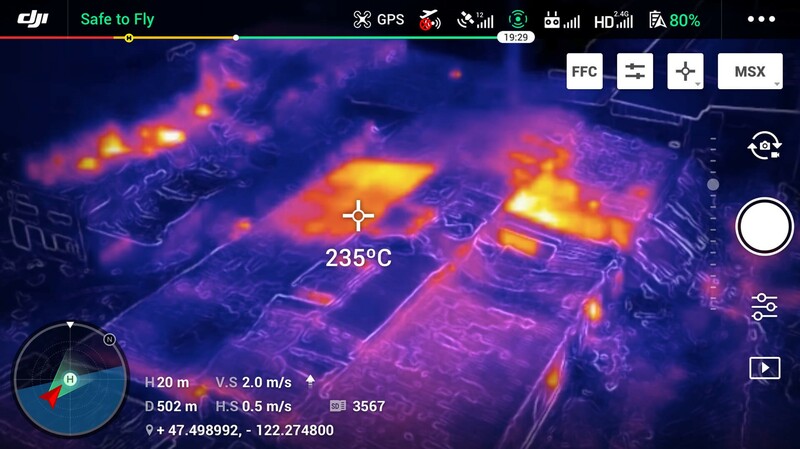 Hotspot is good as it helps isolate thermal signatures from the background. The rainbow palette shows the broadest spectrum of colours helping to identify all different temperatures. Grey just shows hotter features towards the lighter end of the spectrum and colder features towards the darker end. Hot metal is similar to Iron Bow on other cameras and is a fairly popular option. It renders hotter objects closer to white while colder object goes down the spectrum all the way to black. Finally, you have Cold Spot which unsurprisingly works the opposite to hot spot in that it highlights the coldest objects in the frame. Another thermal feature on this is Isotherm is a feature that isolates specific thermal ranges from the rest of the image. DJI has two pre-set options, search people, search fire and the option to set up a completely custom range. The search people temperature range is 26° Celsius – 40° Celsius. The search fire range is 65° Celsius – 400° Celsius. The M2ED has three different options for Gain settings. The Drone also has three DJI flight modes built. Sport mode, tripod mode and position mode. In sport mode, the obstacle sensors are turned off, and the drone uses GPS and vision systems for positioning. The maximum flight speed is 72kph. Position mode works with GPS data. It uses GPS and vision system information to locate itself and stabilise and navigate between obstacles. Tripod mode is based on P-mode, and the flight speed is restricted. This helps make sure filming is more stable. Flight speed, ascend, descend speed are all 1kmh. Does it have GPS and time stamps? Yes, you can ensure that all your videos have a timestamp and GPS coordinates stamp either as a separate file or burned to the video itself. This feature is very popular with Government agencies wanting to keep a detailed account of where, when and what was happening in a particular scenario. To set up the GPS coordinates as a separate file just tick Video Caption as an option on the main app video recording screen. Mavic 2 Enterprise Beacon - This beacon features a bright flashing strobe visible up to 3 miles (~4.8km). This is essential in helping night flight scenarios or poor visibility conditions to help ensure the pilot can keep a visual on the aircraft. Mavic 2 Enterprise Spotlight - This is a dual spotlight with a brightness of 2,400 lumens. This is a powerful aid for pilots in search and rescue along and inspection scenarios. Mavic 2 Enterprise Speaker - This has a maximum project range of 100 decibels (1-meter distance). You can set up to 10 custom recordings to play on the loudspeaker. Mavic 2 Enterprise Battery - Battery with a capacity of 3850 mAh. Typical charging time is 90 minutes. Mavic 2 Enterprise Fly More Kit – This kit carries a lot of useful accessories that will help keep you in the air. This kit includes 2 batteries, a car charger, charging hub, low noise propellers x 2 and Mavic 2 Shoulder Bag. Mavic 2 Enterprise Case – Hard frame case to store your Mavic 2 Enterprise Dual and associated accessories. Is this the right thermal solution for me?